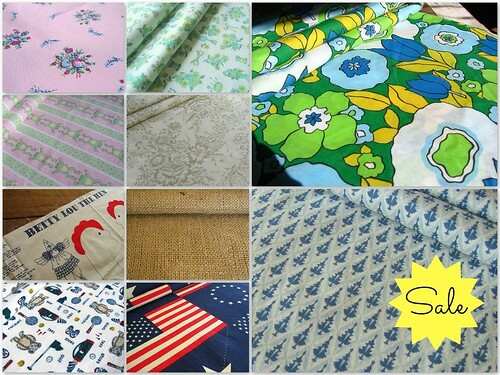 This week I've been tidying up...call it Spring Cleaning and I've discounted several vintage and out of print fabric listings in my Etsy Shop. Take a look see and hurry, as in some cases only a yard or two may be left. Moving on to the weekend, I'm hoping to work on more scrap packs, fat quarters, and fat eighths...however, the gardening bug has bitten hard. I might just play outside all weekend! After the last two weeks, a getaway feels in order - who's with me? 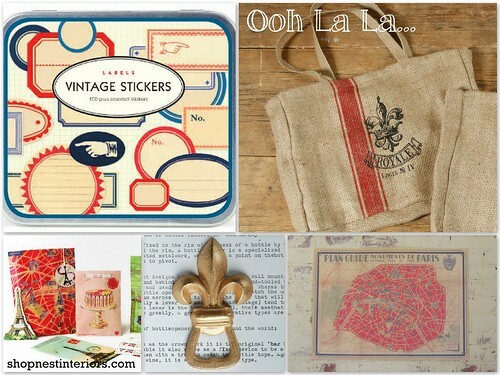 Alas, I can't go anywhere - but I can buy a shop full of French flavored finds and pretend! Seriously, some super cute items have come in the shop over the last week. I'm currently loading it up on my main website for you to take a gander and make a mini-retreat, if you like? 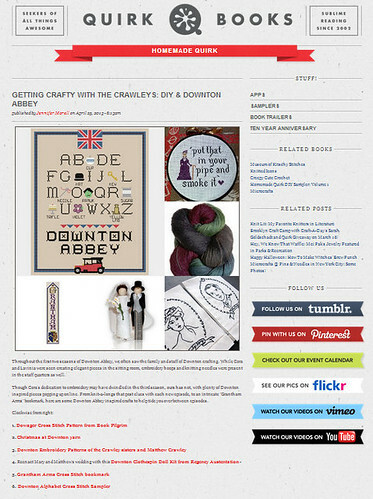 Also, very sweetly, Quirk Books included my Downton Abbey Alphabet Cross Stitch Pattern on their blog this morning. I'm nestled in with some other lovely Downton DIY - check it out! And a nice mention from Peacoats and Plaid; my New Girl TV Show Cross Stitch Pattern was included in their "Not Your Grandma's Cross Stitch" love list - awesome and thank you! This is probably not the best way to start a post...but I'm super aggravated. After we all had that collectively bad week watching Boston try to rise up from horrific and senseless violence, yesterday, not even an hour after I arrived at my shop I receive a frantic text that a shooting occurred near the high school in Ponchatoula...a mile or two from the store. The high school was unaffected thankfully, but one person is dead and the suspect is still on the run. No one has instituted a lock down for our town similar to Watertown, but some of my fellow shop keeps have locked their doors today. Right now a spring rain storm has washed a hush over the town as I keep watch over the door. And my frustration lies in all these miserable acts of violence. All last week we wanted to know why? And similarly, us townfolk are asking the same today. But what does it matter? Do these pricks really think whatever their cause du jour or motive is that we will be convinced by their dreadful deeds? Maybe crazy inspires crazy; I just don't know, but what I do know is they (the bad guys) have missed their mark. You can see it in the defiant survivors and those rushing to their aid in Boston; even in this little town I'm not locking my shop doors even though a manhunt is underway. I read a really beautiful post from Alicia over at Posie Gets Cozy (all her post are wonderful) where she touched on the importance of creating amongst so much destruction. It mirrored much of what I had been feeling last week and so on this week. Goodness knows I've been sewing, crocheting, and cross stitching like mad. So, yesterday by way of instagram, I came upon a collective quilting effort for Boston; To Boston With Love to be specific. Coordinated by the Vancouver Modern Quilt Guild, a collection of quilt block flags will be collected and made into an installation in June, I believe. I'm new to sewing and I'm not positive I'm up for the pattern posted yet (tho it is darling)...lots of people are posting alternates to tie in with the standard flag. I encourage all my sewing adept readers to give it a try and to create something amid the chaos. ***UPDATE 4/25/13 - the manhunt is over in our tiny town; the suspect was wounded in a gun fight (eerily similar to last week's Boston case). People are out and about and traffic is already a buzz outside the shop - so hopefully we can lull ourselves back into the sleepy little Southern town that is Ponchatoula. How long has Etsy had digital downloads??? I stumbled on this yesterday when I was entering my daily listings - whoa! This is life changing! And frankly about time. Not that I minded running over to my computer to write an email, attach the file and pray that my message didn't go into someone's junk mail; it's just that in this day and age, people expect what they want when they want! So Voila! THREE ways to instantly download my cross stitch patterns - pick your platform (all venues, including Etsy, do not limit downloading as long as the listing is still active). Go forth and stitch! I spent today, a weirdly slow day at the shop, immersed in a different kind of stitching - the April Craftsy Block of the Month. I was actually pretty nervous about this one - curved piecing forming a fan block. I've just gotten comfortable with stitching straight. I did fairly well, for my first go at it. I'm not sure why though, my block is a good inch shorter than it is suppose to be. I know a lot of people had trouble with this because they did not print the templates to scale - I did, for sure. So, again, we will chalk this up to lesson learned. Overall, I'm pleased with my progress...and more pleased that I'm actually sticking with this! After the horrific events of yesterdays Boston Marathon, you know what y'all...it's time to launch this pattern. Rainbows, Hearts, and Unicorns - f*ck yes! I've spent the last couple of months slowly plotting away on my unicorn believer pattern, sometimes watching the news from the aftermath of Newtown, an ineffective congress on gun reform, and the debate on whether we should ALL have equal rights. 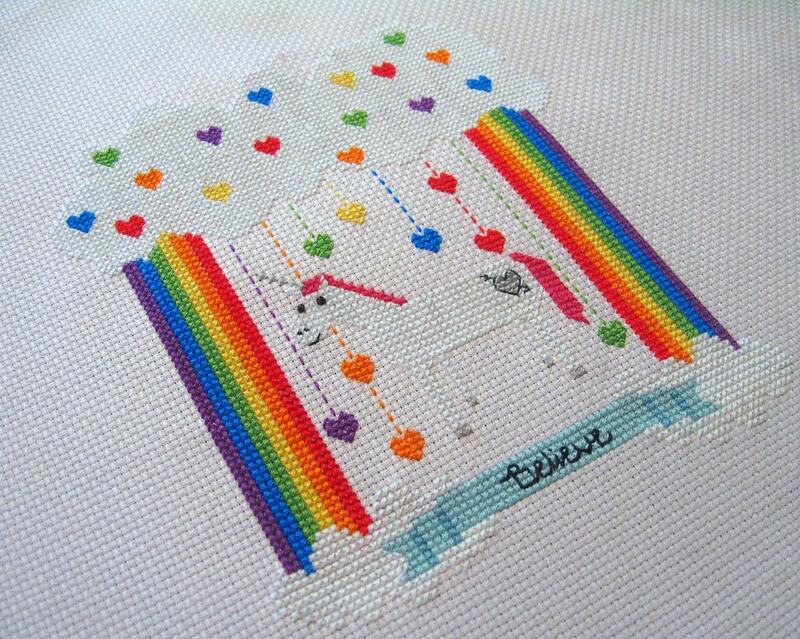 Some nights all I could do was look away into the happy silly face of my stitched unicorn. And as silly and fun as my patterns can appear, to me they always have a deeper meaning than just face value. Believe me, as a Lisa Frank Trapper Keeper toting child of the 80's, I grew up wishing unicorns were real (and that I was Madonna too). Now, I know sometimes on rare occasions we can see actual unicorns...from people changing their Facebook and Twitter profile pics to equal signs to a brave few running to smoke and screams. Let's all remember to be the unicorn when the opportunity arises...someone needs to believe in you. This is my first pattern that allows for customization; included in the pattern is a full upper and lower case alphabet to put your own message within the 30 spaced banner...great for something as uni-corny as "my other ride is a unicorn" to the names of a couple to be wed. Also, this pattern encourages you to pick a contrasting color of aida cloth (Stitchnmomma has some nice hand-dyed options); you can even vary a bit from the selected floss colors. Make it your own! The pattern is currently available through three venues: Etsy and two instant download sites Craftsy and Meylah. "oh, hunny, we can't tell you anything until we see the dawg"
"well, she's not having trouble breathing, is this serious, do you see this frequently???" "I guess...often enough, I guess" in a sassy drawl. So, safe to say, not the most qualified bunch answering phones at this facility. At the same time I get a text referencing how to dose your dog with Benadryl. So, I made the decision to go ahead and forgo the "quality" care of the "often enough" facility since she showed no problems breathing and in an attempt to give her some immediate relief. It worked for a bit; but around 11:30 we went through round 2 - hives and vomiting. It was just heart wrenching; she settled finally around 1am. Once morning broke we called our normal vet and they were really surprised that she had a reaction and asked that even though she pulled through it to bring her in for a steroid shot. I know this personally, having been though a rare cancer, when people tell you "wow, this is so rare, it like never happens" it really doesn't help for the people going though it! I should also mention as I'm clutching Chico in the waiting area (because they double booked us), the local funeral home truck pulls up front and starts removing the weeks' patients that didn't make it (really no back door here?). Agggh...what an experience! 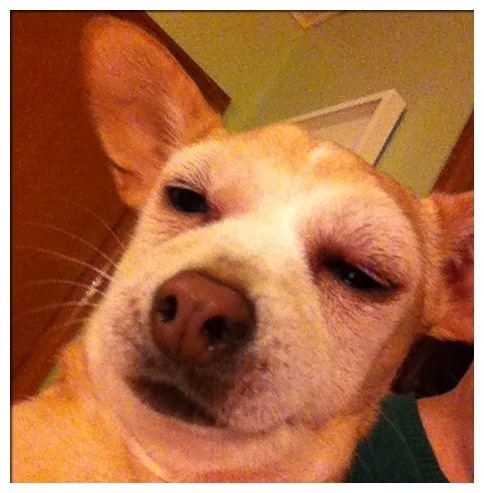 So, Chico is back to her old sassy self, but to follow up I did a bit of research and found some interesting stuff about the vaccinations we give our pets. First and foremost they were developed to protect people and not so much the pets that endure these concoctions. Most rabies vaccines have traces of mercury, that can cause long term cognitive disorders, allergies, a certain type of cancer at the injection site, and it's like rare y'all...but yes, death. Similar to a boxing match, I finally got my vet to fess up to what brand that was given to my dog...it was Nobivac. You can google it and see my dog's symptoms were not totally uncommon. Honestly, heretofore, I'm not sure what we will due for future vaccinations. We live in rural America and no one here is a real stickler to verify who's got what and where. I am learning that there are different rabies vaccines...it's just up to you to find a vet willing to give you your preference. Most people seem to recommend Merial IMRAB TF or (Merial PUREVAX Feline Rabies for Cats) - the TF stands for thimersol free, meaning the mercury is not used in the preservative of the vaccine. Honestly, it seems like the craziest thing to have almost lost our pet to something considered preventive care. But even worse, was the way so little information and care was provided by the emergency vet and our own local vet. And by the way, everyone that we mentioned this tale to that knew of the emergency care facility remarked that you can't even get through to see the vet until you slap down a credit card. I'm really glad I didn't need their services because it sounded a lot more like a business than a care facility. I hope if you found this post you can make an informed decision about the care for your pet. I've been seriously spring cleaning and found more scraps to offer. The last couple months, if you remember, I offered up bags of thick cottons including barkcloth and twills...they went FAST! 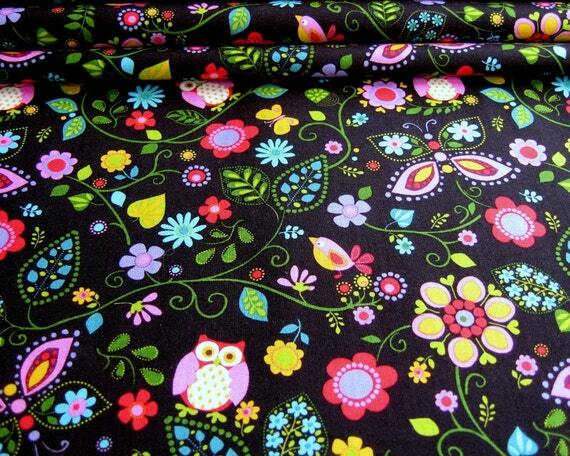 This offering includes just cottons suitable for quilting and fashion for dress or home. 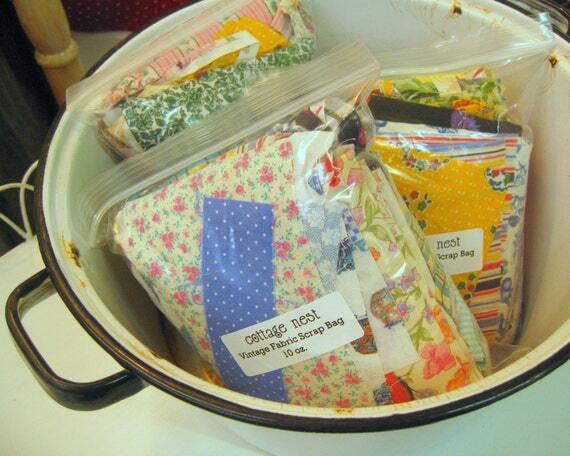 Each bag is a real mix from fabrics I've identified as ranging from the 50's to the 80's. I think they are perfect for anyone interested in repairing an old quilt...I think you'll find lots of small scale florals and geometric prints. 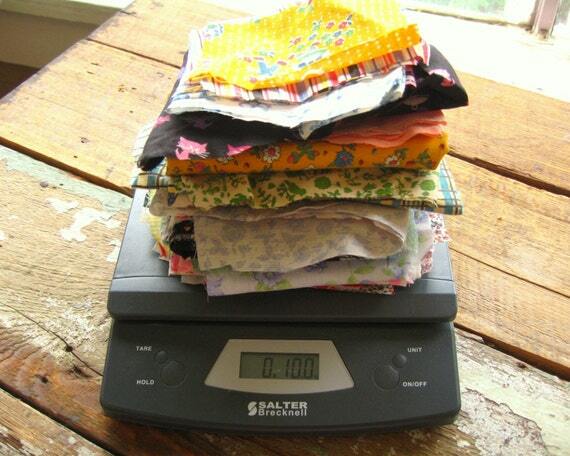 I receive a lot of messages about what sizes of fabric are in the bags...it's a grab bag, y'all! Be surprised! 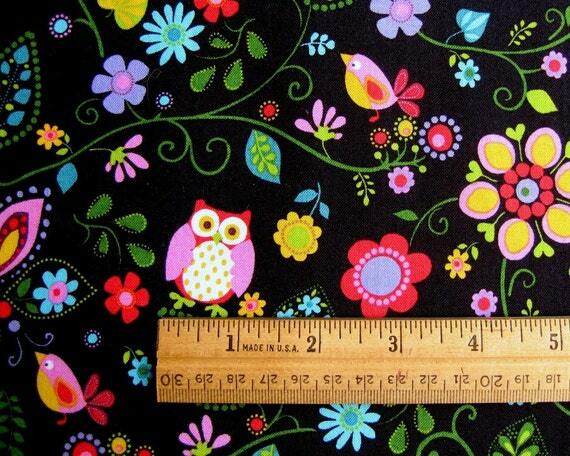 Ok, honestly they range from small strips to maybe larger pieces up to an 1/8 of a yard. Each bag has a variety of sizes, so you will never be stuck with just teeny-tiny pieces. One count I did was well over 40 pieces of fabric, the next I just gave up and said "whoa, this is a lot of fabric!" As I stated before the last batch went really quickly so if you would like to take advantage of this small offering, visit the listing here. Three times a year...more if I'm lucky, I go up to Jackson, Mississippi to pilfer one of my most favorite thrift stores. It literally takes me three hours to walk the store as every nook and cranny is a treasure trove! I stocked up on lots of fabrics - more new than vintage this go round, but someone had donated some really high end cottons (yay me! ), I even found yarn, buttons, and they had a tremendous sale on books...I snagged some really great books on sewing, needlework and a very interesting copy of how to bind a book (like I have time for that). My best find by far (maybe ever) was a Eva Gabor wig box in orange...no wig but its so amazing. It needs a little work but it's fascinating! After digging in a thrift store for hours, we like to treat ourselves to a really nice restaurant (talk about a 180)...we are a bit stuck on Sophia's at the historic Fairview Inn. If you can get past the hostess who's a bit of a troll, its a real hidden gem. I ordered the drum and it was yum yum! I usually like to walk the grounds, but a cold snap kept us inside; the azaleas were about to pop and an actual dogwood was in bloom...most of them have died out in my neck of the woods due to a blight.